IF THEY SAY I'M A WITH, THEN I MUST BE A WITCH! The Witches of Gambaga is a disturbing documentary about a community of women condemned and exiled as witches to the village of Gambaga in northern Ghana. The film was produced by Nigerian feminist academic Amina Mama and Ghanian filmmaker and writer, Yaba Badoe, who also directs and narrates the film. During repeated visits over a period of 5 years, Ms Badoe interviewed the women, traditional rulers and community activists in the region. The village of Gambaga has traditionally been a sanctuary for women accused of witchcraft where they are protected by the village Chief. Many of the women are elderly and arrive after been driven into exile by their families. Guilt is established by the arbitrary way a chicken dies following an accusation by a male or even a young child. The bird’s throat is cut and if it dies with its wings down, then the woman is a witch. In trying to understand what it means to be a witch, the film’s producer and narrator, Yaba Badoe, asks the question which goes to the heart of the film, ” [what] If witchcraft traditions are so deeply entrenched, that to be born a woman is to be born under a shadow of suspicion. ?” This is contrasted with men who can also be witches but for them the practice is used in a positive way such as to protect his house or family. The belief that some women and men have supernatural powers has existed throughout history and across the world as a way of maintaining social control and upholding patriarchal structures. But invariably it is women who have been singled out for persecution at different points in history usually when communities are facing a crisis or series of events which are unexplainable or unpredictable. To understand the naming of women as witches requires close scrutiny of the factors behind such beliefs. On the one hand, the powers of Pentecostal churches and Muslim marabouts in Ghana and other parts of the continent, and on the other, the use of traditional and spiritual practices for explanations around the failure of nation states to address poverty and lack of socio-economic responsibility by governments. It is similar to cultural and religious fundamentalism that is the driving force behind homophobic laws on the continent which are also being used as political decoys. Both the charismatic churches and some local Imams feed on witchcraft as explanations of social and economic problems. The power of male authority, patriarchal traditions and the low status of women are central to this. It is pertinent to point out that although accusations of witchcraft cut across class and age, it is those women who are seen as strong and independent who are most at risk. The Witches of Gambaga are protected by the paramount Chief, the Gambarrana and there is no doubt he benefits from their presence. They pay to stay and must pay to leave, so it is in his interest to accept either a “confession” as proof of guilt or the the direction of the chicken’s death and to ensure the practice continues. But as the film points out, good and evil is never simple and change is always possible. As we see from the film, community engagement by local community activists has been central to eliminating the practice as well as trying to reintegrate accused women back into their villages. Even though this can be a slow process, it is preferable to a confrontational strategy led by outside people, especially westerners, descending on communities. Once the work has been consolidated at a very local level then it can be taken up by activists at a national level and moves towards intervention by the government and community leaders. The Witches of Gambaga shows that there is another way to addressing traditional and religious practices which hurt women and children. Women activists are beginning to speak out against the practice and the film itself has contributed to raising awareness at national level. Changes in attitudes by local leaders can also contribute to ending the practices of accusing women of witchcraft. For example in one of the villages where the practice was prevalent, the new Chief has chosen to ignore the supernatural and instead intervene by counseling families and encouraging a change of attitude towards women in general. However despite this, Badoe points out that Ghana's Minister for Women, whose constituency is in the Gabaga region, did not once visit any of the villages or attempt in anyway, to engage with community leaders and chiefs or give any support to the women. The success of the film is due to Badoe’s persistent visits and her personal engagement with both the women and the Gambarrana who allows her to film the “secret” ceremony which decides on the guilt of the women. Her interviews are intimate and heart-breaking, showing both the vulnerability of the women as well as their agency and strength. One young mother of two is ambivalent about her exile but at the same time focused on ensuring her children are educated by raising money to send them to school. Thankfully, the film lacks the “pitying” and patronising tone often found in documentaries made by non-Africans as neither the women nor the audience are treated with anything but the utmost respect. The strong feminist intervention places the women at the center and focuses only on the issue it wishes to confront and expose leaving all of those involved including the audience proud and empowered. The Witches of Gambaga has has been shown and well received by audiences in Ghana and in Burkina Faso. 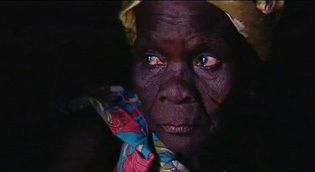 Witches of Gambaga was the winner of the 2010 Black International Film Festival Best Documentary Award. Watch a trailer of the film “Witches of Gambaga”. The film was also selected for special mention at this year’s FESPACO in Burkina Faso. Ms Badoe is also author of True Murder, a mystery novel set in England.